The historic four-section viaduct is commonly referred to as the Stone Arch Bridge over the Fall River, which is approximately 42.8 mi. from Springfield, along the Knowledge Corridor. 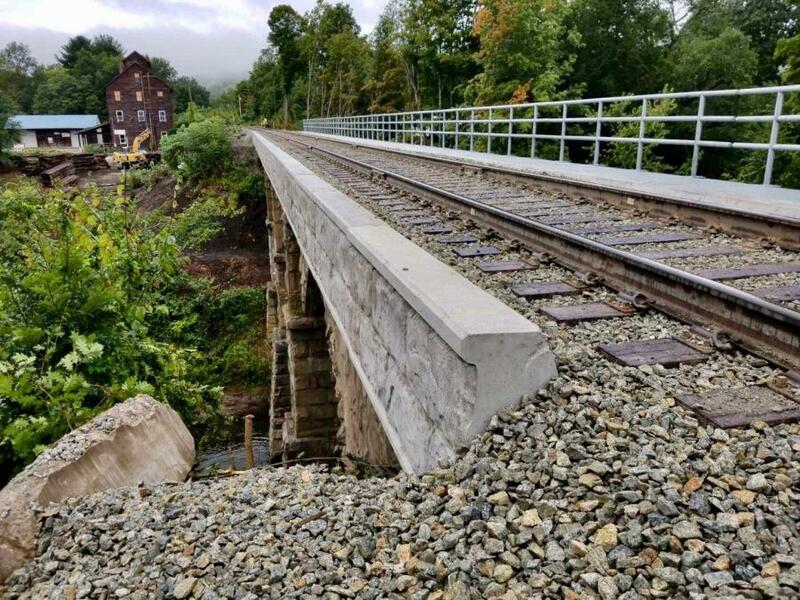 In Bernardston, Mass., cleanup efforts are under way following work to ensure the reliability and continued use of Bridge 42.81 for passenger and freight railroad operations. The rehab took place in a short period of time, but required a great deal of coordination. "The primary construction was successfully performed during a five-day service outage period in mid-September," said Massachusetts Department of Transportation (MassDOT) spokesperson Patrick Marvin. "This time-frame was coordinated with numerous stakeholders, including Amtrak, CTDOT, VTDOT and MassDOT, in order to accommodate railroad traffic, the local community and to allow concurrent work by Amtrak on a similar infrastructure project requiring an outage in Windsor, Conn., on Amtrak's Hartford Line." The historic four-section viaduct is commonly referred to as the Stone Arch Bridge over the Fall River, at railroad Milepost 42.81, which is approximately 42.8 mi. from Springfield, along the Knowledge Corridor. The $2.1 million project is being funded by MassDOT as part of the Knowledge Corridor improvements. Amtrak currently operates northbound and southbound "Vermonter" trains over the bridge. The Vermonter operates daily between Washington, DC and St Albans, Vt. The physical bridge structure is approximately 208 ft. in length. The re-decking of Bridge 42.81 is one component of MassDOT's effort to improve reliability on the Knowledge Corridor. All work was completed in a narrow window, with minimal nighttime work. After-hours of work, which presents special safety challenges, was carefully considered during construction preparation planning. Marvin added that special consideration was given to the redesign of the 26 new precast concrete U-shaped "tubs" to provide improved stability and safety, as well as historic and architectural consideration, such as the addition of a safety walkway, increased depth of the tubs and special treatment of the precast concrete outside tub faces to mirror the historic stone design. Pan Am Railway officials were part of the project team and provided staff to support the undertaking. According to MassDOT Rail and Transit Administrator Astrid Glynn, the closely-coordinated operation involved a number of players. "All work was carefully planned, from design, through material procurement, delivery, staging of equipment, construction, quality assurance, inspection and placement in service for railroad operations. The project was completed on schedule and on budget." 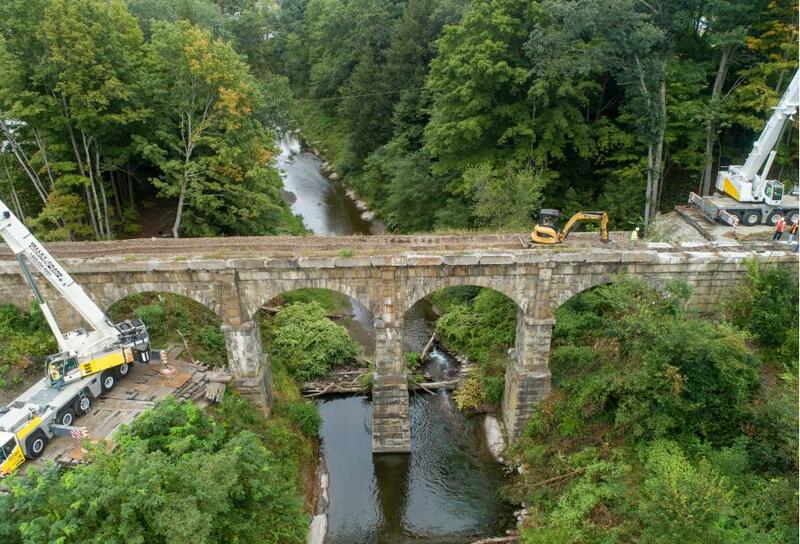 The bridge and more than two dozen existing concrete tubs were previously inspected and determined to be in sufficient structural condition for removal. When the track outage began, the existing track was removed in panels, then each concrete tub was lifted off the stone deck of the bridge. 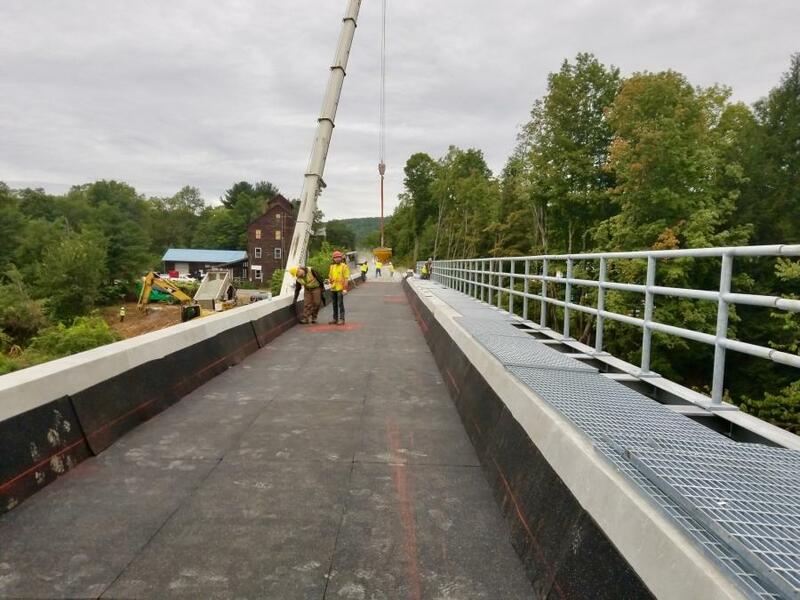 The stone bridge deck was carefully examined, cleaned and then prepared for receipt of the 26 new precast concrete tubs which were wider, higher and included a safety walkway. Anti-graffiti coating was applied during factory manufacture of the precast bridge tubs. All the new tubs were installed, grouted and a thick vibration/noise pad was applied. Once the grout had cured, a base of new stone ballast was installed on the new bridge deck, followed by the new track panels which were then connected at both ends to the existing track. Additional stone ballast was installed, and the track was surfaced and laser lined to its proper location. All existing materials will be removed or placed in other locations as required. The new 136RE continuous welded rail (CWR) will be installed, replacing the new 136RE rails used to construct the track panels. Pandrol plates, clips and other fasteners were installed similar to the track work on the Knowledge Corridor. "Any railroad project involving active operations is complex," said Glynn. "The special challenges for Stone Arch Bridge 42.81 included historic, safety, special design considerations, material procurement and handling, crane locations and staging on each side of the bridge to facilitate complete and safe work zone coverage. 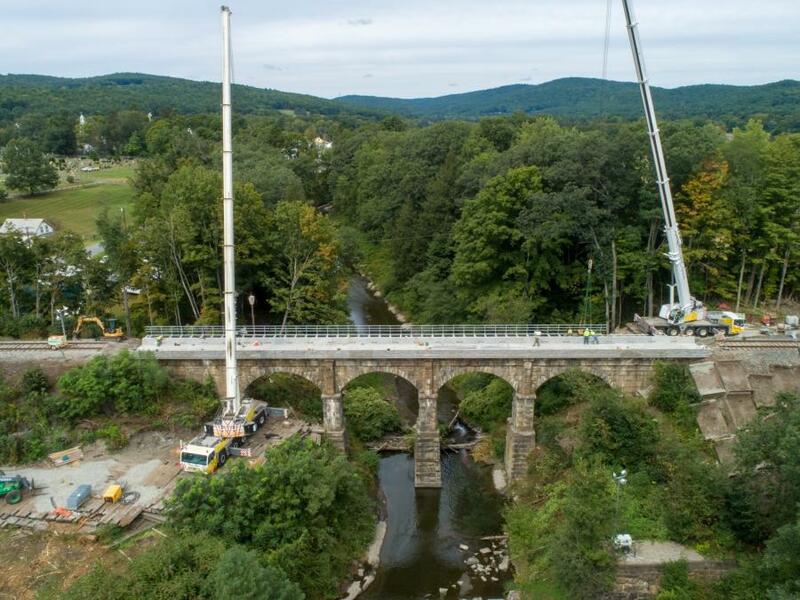 "The project also included some day and night time work, a compressed schedule due to a specific Amtrak service outage required busing, community outreach and stakeholder communications and the need for good weather and warm temperatures. 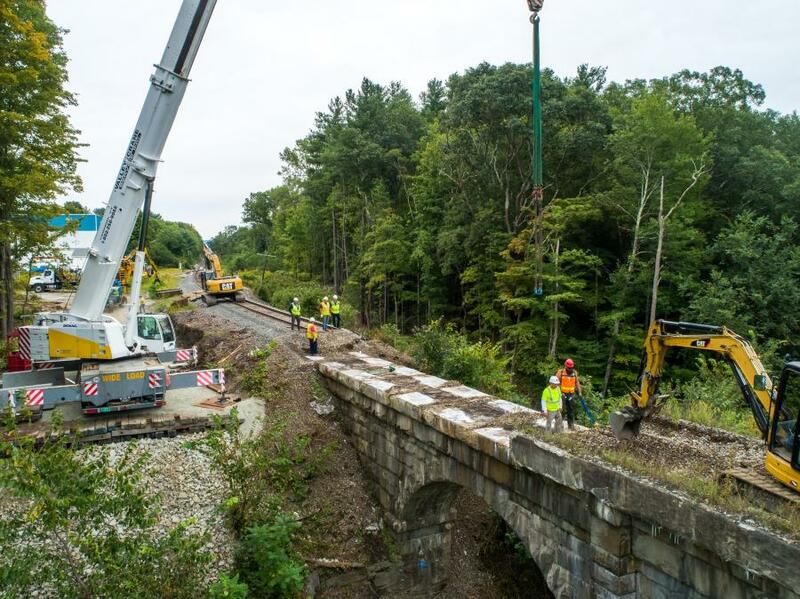 MassDOT's contractor, design consultant, program management consultant, and Pan Am Railway staff support contributed to the success of the project." Preparation work began prior to the outage. Actual construction started soon after the northbound Vermonter cleared the area, and continued until work was completed when the final inspections occurred and a Pan Am freight train crossed the bridge at slow speed under careful inspection of project staff. Rehabbing the bridge required a special safety work plan to ensure site safety throughout construction. The architectural treatment of the new precast tubs also involved coordination with the pre-cast manufacturer, to ensure quality and consistency. Glynn said weather was not a significant factor for crews. As for the condition of the site prior to construction, MassDOT determined that the bridge required replacement of the concrete bridge tubs to support overall state-of-good-repair infrastructure initiatives. 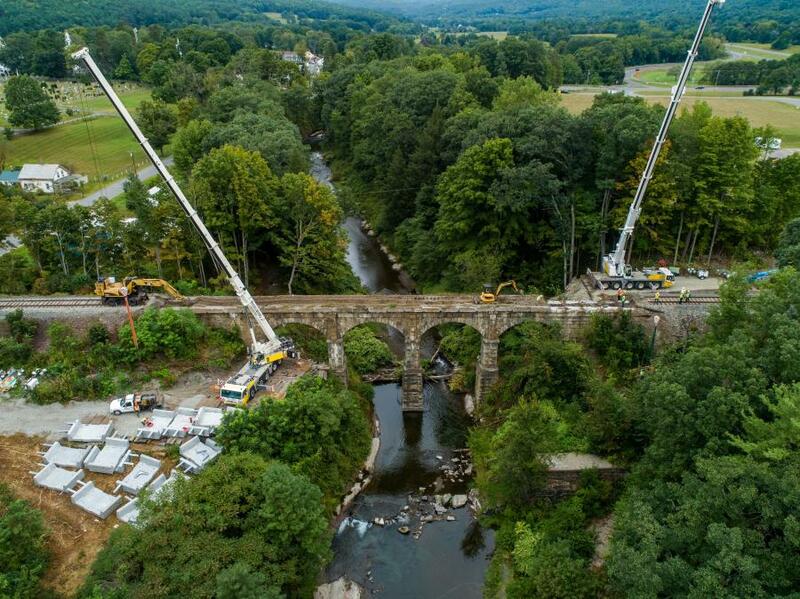 Two large cranes with telescopic booms capable of reaching past the center of the bridge were used to remove the old tubs and install the new ones. Railroad track surfacing equipment was needed for lining and surfacing the new track to intended grade and alignment. Main items used during construction included the new precast concrete tubs, as well as new 136RE rail, wood railroad ties, ballast mat, stone ballast, Pandrol plates and other track materials. 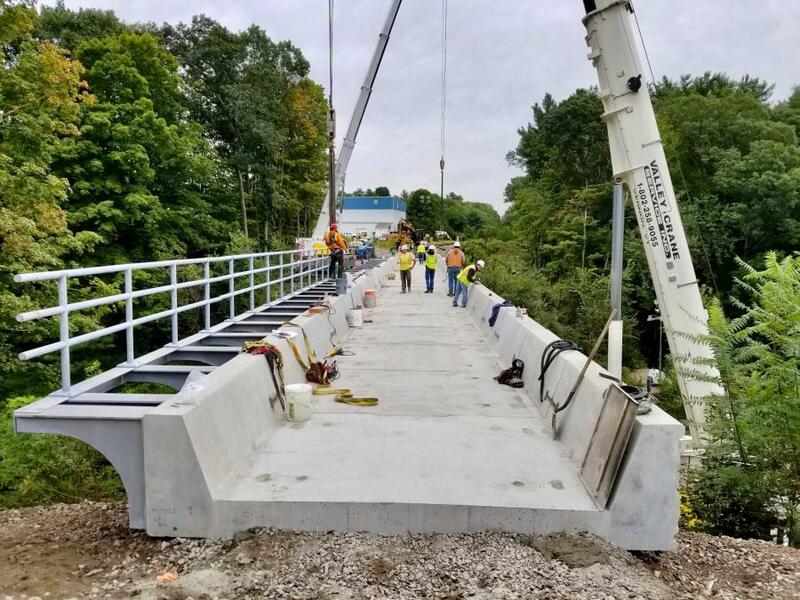 Planning, design, construction staging preparation, safety planning, material management, coordination with all stakeholders and good community outreach were all required to ensure a successful project for Bridge 42.81. Glynn noted that it was extremely gratifying to be involved in giving the bridge new life. 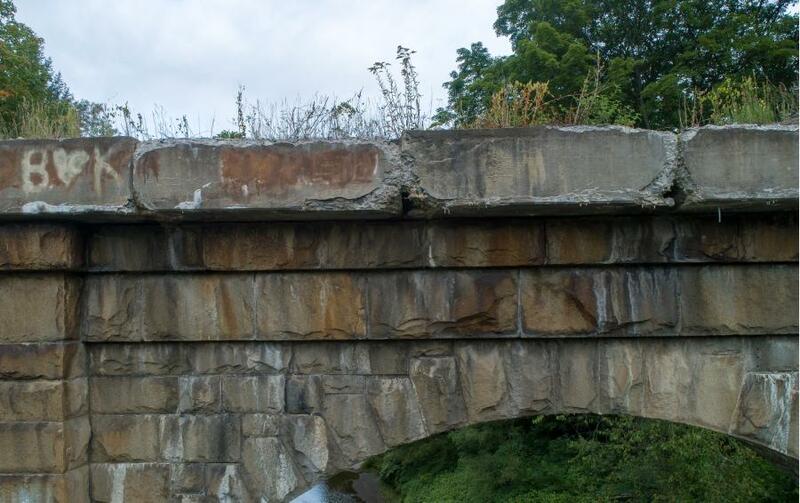 "Improving a historic structure such as Stone Arch Bridge 42.81 is always a challenge, and it's very rewarding to the project staff, MassDOT and the community." The railroad bridge was designed and built in 1846 by Theodore Judah, who later met with President Lincoln and Congress and convinced them to provide funding to survey and build the Transcontinental Railroad. Born in 1826 in Bridgeport, Conn., Judah studied engineering at Rensselaer Polytechnic Institute. He later became an American railroad and civil engineer, and was a central figure in the original promotion, establishment and design of the First Transcontinental Railroad. Judah found investors for what became the Central Pacific Railroad (CPRR). As chief engineer, he performed much of the land survey work to determine the best route for the railroad over the Sierra Nevada Mountains. Mount Judah, an 8,245-ft. peak in Placer County, Calif., was formally named for Judah in 1940.